It is truly an honour and privilege to be elected as the 33rd President of Rotary Club of Kuching Central. I have been part of the Rotary family for over 20 years, starting as an Interactor; joining Rotaract Club of Kuching before becoming a member of this vibrant Rotary club in 2013. I wish to thank PP Leslie Phuan and PP Thomas Ngu for encouraging me to join Rotary Club of Kuching Central. RI President Barry Rassin’s Presidential theme for this Rotary Year is “Be The Inspiration”. As the club president, I will always be inspired to lead and continue the good work of my predecessors. We will continue with our signature project; Prevention of Blindness with greater intensity this year, thanks to a most successful fund raising effort from our Rotary Charity Run 2018-Gift of Sight. In addition, water and sanitation projects under Rotary’s core areas of focus will also be undertaken. 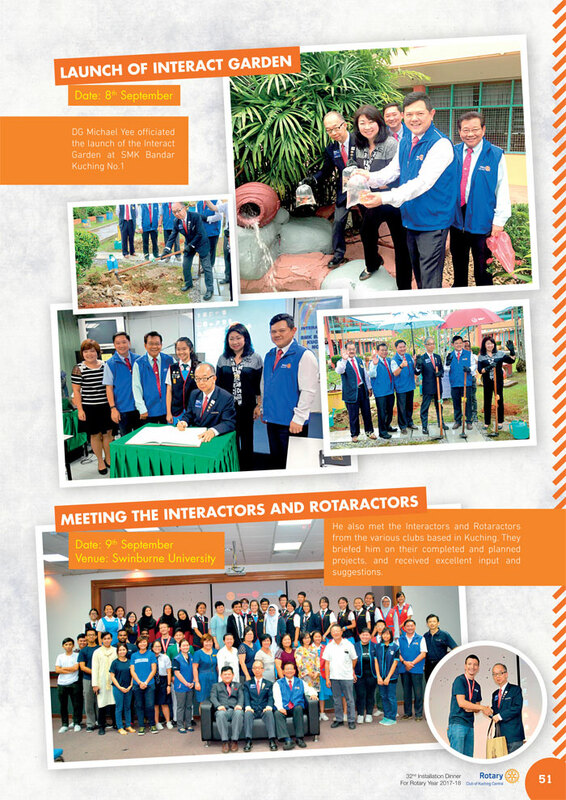 Rotary Club of Kuching Central has a well-established Youth program with 5 Interact & 2 Rotaract Clubs under our care. We have always emphasized on our Youth Development and will undertake to organise I-Quiz Sarawak regional competition for the 4th consecutive year. We also plan to organise a RYLA camp in Kuching in December 2018. We will endeavour to undertake more joint projects between Rotary and our Youth Clubs. District Governor Henry has selected RC Kuching Central to be the host club for 30th Pan Borneo meet in Kuching from 2-4 November, 2018. Please join us for this event which will feature interesting programs and great fellowship. We will continue to enhance our relationship with sister clubs, friendship & partner clubs. I will work towards undertaking more joint projects with them. 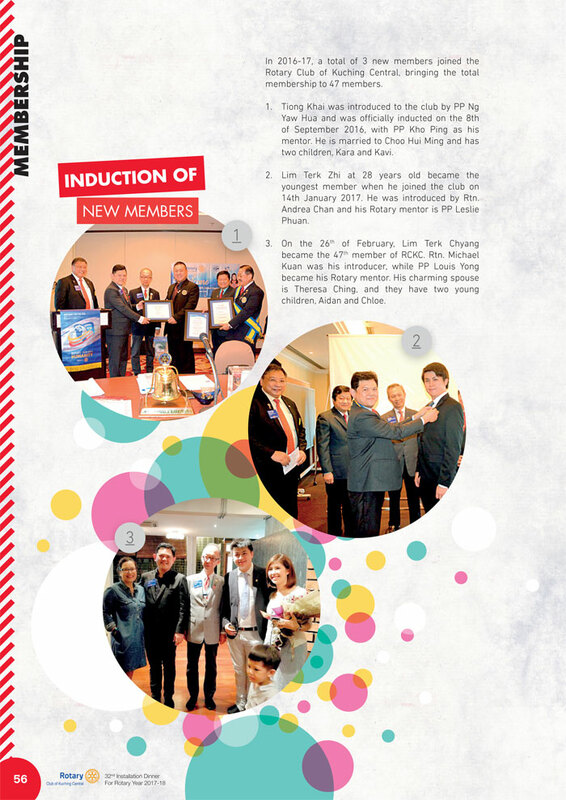 Dear RC Kuching Central members; besides service to our community, I will endeavour to create more fellowship gatherings among our members and to continue our Club’s unique inclusion of family members in all our activities. Tohether We Serve & Enjoy Rotary. My warmest greetings to all of you as we start a new Rotary year 2018-19. As your District Governor for this new Rotary Year, I will be your friend, your partner and your supporter in all that you do in the name of Rotary. I sincerely want to work with all Rotarians and Rotary clubs to write a new chapter of our Rotary story – a story that can inspire others to become Rotarians. The Rotary movement worldwide now stands at a cross-road. Our members are aging. In addition to this, we live in a world with rapid technological changes especially in the areas of IT and social media and these changes can be disrupting. Even as we try to bring in new members there is a widening of values and perception between the ageing Rotarian and the younger ones. Given all these changes, a new class and a new set of values will emerge within the Rotary movement in a matter of time. Whether we can move forward from this crossroad to a bright future depends a lot on whether we have the boldness to choose the right path and the right plan. RI President Barry Rassin has pointed to us such a path and plan. He wants us to “Be the Inspiration” and come together to “create lasting change – across the globe, in our communities, and in ourselves”. To move forward, we need to go back to basics on one hand and also we to embrace change on the other hand. Let me explain this seemingly contradictory terms. Going back to basics means recognising the importance of membership growth. Rotary is a membership organisation. Our assets are actually our members. As an organisation and a world-wide movement, we can either thrive or fade away depending on whether we want to use our collective ability to grow our membership. If we fail to bring in new and younger members into our fold to tackle our aging structure then we will fade away and forfeit our important role in serving humanity. Therefore, I encourage all clubs to go all out to attract new members especially younger members. Younger Rotarians will inject a fresh perspectives of the world and new ways of doing things into our midst. One available pool of young people to tap are our own Rotaractors. We must engage and prepare them to become Rotarians. We also need to go beyond mere numbers. It is important that we become not only committed but knowledgeable and up-to-date Rotarians. This means that we Rotarians must equip and update ourselves with the latest Rotary information and knowledge. We can achieve this by attending Rotary seminars, District Assembly, District Conferences, by accessing our Rotary IT platform (My Rotary), by inviting experienced Rotarians as speakers, etc. Going back to basics also means that we must build strong Rotary clubs. We must actively engage members to reduce attrition rate. There is also a need for the District to help smaller clubs to grow in membership. Another important area to consider is our our mindset. The world has changed dramatically in the 113 years since Paul Harris and his three friends held the first Rotary meeting. To stay relevant to our societies and to create lasting change we have to renew our thinking. Be open to new ideas and new ways of doing Rotary work and activities. Be ready to use social media to attract members especially younger ones. Be united to do bigger things. We must think of ourselves as Rotarians first, not just isolated members of a particular Rotary club that has no relationship or dealing with other clubs. Be willing to look beyond your own clubs and see what we can do together as a family of Rotary. No clubs can be perfect in all things. They can be strong in certain areas and weak in other areas. By working together, one club’s weaknesses can be overcome by the strengths of other clubs. By working together we can take on bigger projects. This in turn will help raise the image of Rotary in our communities. There are three ways in which we can come together to build stronger clubs and at the same time help the smaller clubs in our District. First, bigger clubs can work with smaller clubs to organise joint-programmes to promote membership and to raise greater public awareness of Rotary. Secondly, I encourage some of our clubs, whether big or small, to take the lead to come together to hold joint-fellowship events on a regular basis. On my part I will be working with the Governor’s Special Representatives and the Assistant Governors to help kick-start these joint-club events. Thirdly, we have to find ways to help smaller clubs seek out strategic partners and stakeholders so that they can enter into a long-term partnership with them to serve the communities. By so doing, small clubs can keep their members engaged in meaningful projects, widen their network and help them to look out for those non-Rotarians who are keen in community work to become members. Imagine how strong Rotary would be if we can unite among ourselves, work together, work with non-Rotary partners, take on bigger scale projects and in the process help to create meaningful and lasting impact on our communities. Together, let’s write a new chapter in this Rotary year, a chapter that will inspire others. A chapter that people will want to read over-and-over again. 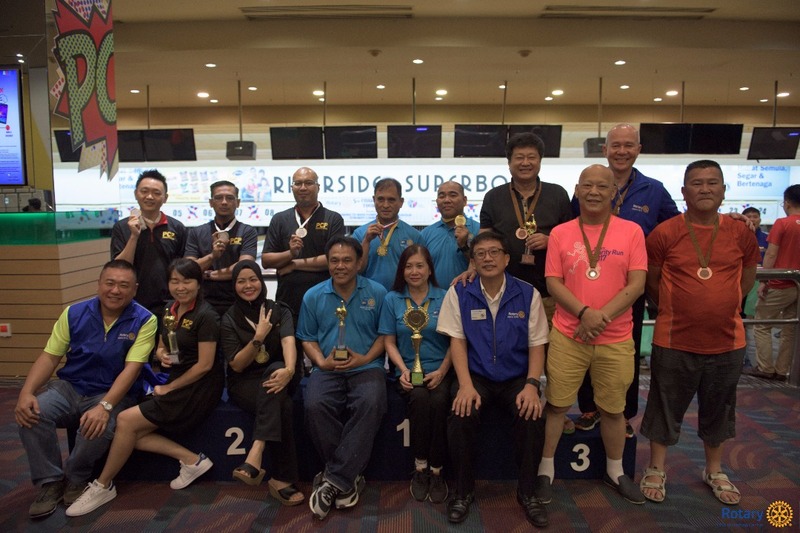 KUCHING: The 5th Charity Bowling Tournament was organized by the Rotary Club of Kuching Central at Riverside Superbowl here on Jan 7. Dato’ Thomas Ngu, who officiated at the event, revealed that the funds raised would be used for the many projects the Rotary Club of Kuching Central has been carrying out to serve the community. “Some of these projects include free eye screenings, cataract operations, solar and clean water systems, festive food parcels, and more,”he said. “Our projects are mainly focused on the local community, especially those from the lower income group or in rural areas,” he added. A total of 24 teams took part in the tournament including two Rotary clubs outside of Kuching. The Rotary Club of Bandar Seri Begawan, Brunei which is also one of the sister clubs of the Rotary Club of Kuching Central, emerged as the 2018 champion with a total pinfall of 1,820. Meanwhile, teams PCP and Eritel Telecommunication emerged second and third respectively. Dominador Ortega Jr representing the Rotary Club of Bandar Seri Begawan was the Top Male Bowler with a total pinfall of 512 while Dayang Salina of PCP was the Top Female Bowler with the highest combined score of 483 points. 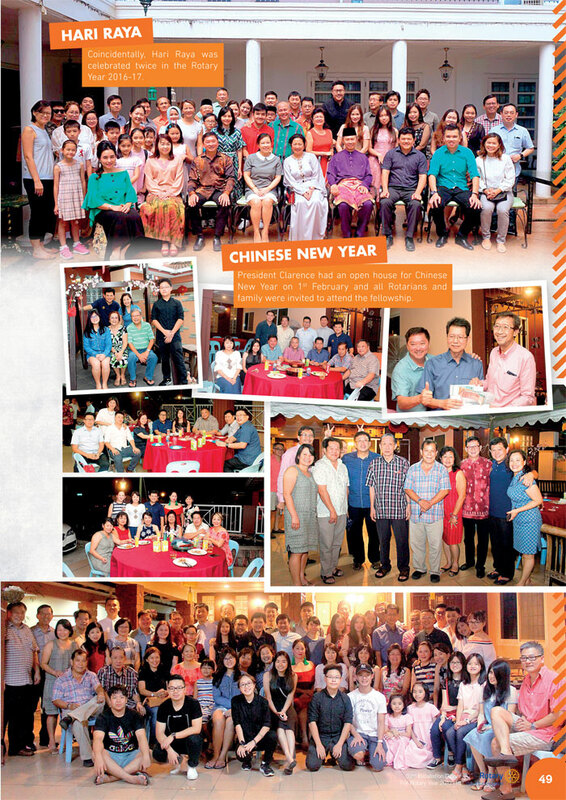 The Rotary Club of Sarikei was adjudged as the Best Dressed team. Organising chairman Tiong Khai said RM24,000 was raised through the generous sponsorship of participating companies and indivduals in the tournament. He was thankful to the management of Riverside Superbowl for their continued support of the event by sponsoring the venue. The Rotary Club of Kuching Central has previously carried out several community projects including over 200 free cataract operations for those in the lower income group or rural areas since 2016. In conjunction with the new school year, the club recently handed out 1029 school kits to students in various parts of Sarawak in collaboration with Yayasan Sime Darby and several other Rotary clubs. 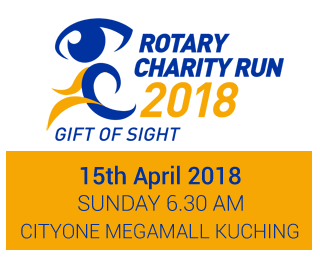 Currently, the club is organising the Rotary Charity Run 2018 to raise more funds for the aforementioned free cataract operations, free eye screenings and other activities. 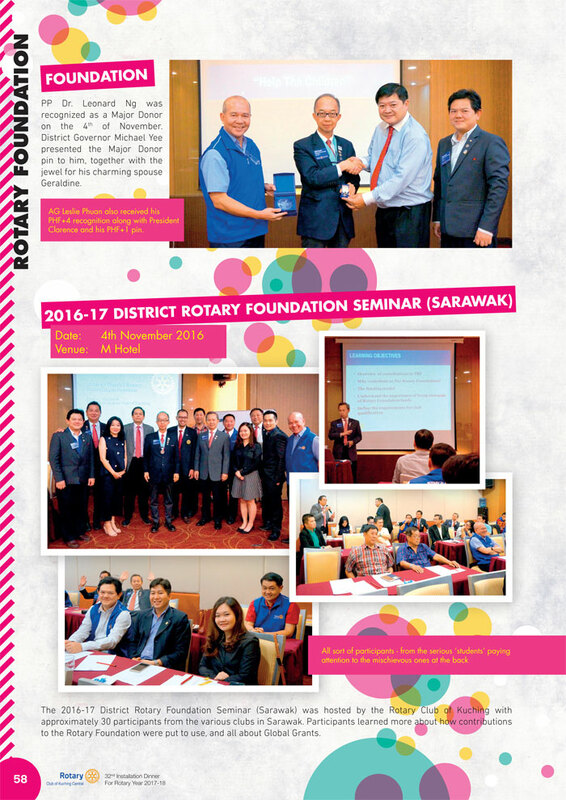 The 2016-17 District Rotary Foundation Seminar (Sarawak) was hosted by the Rotary Club of Kuching with approximately 30 participants from the various clubs in Sarawak. 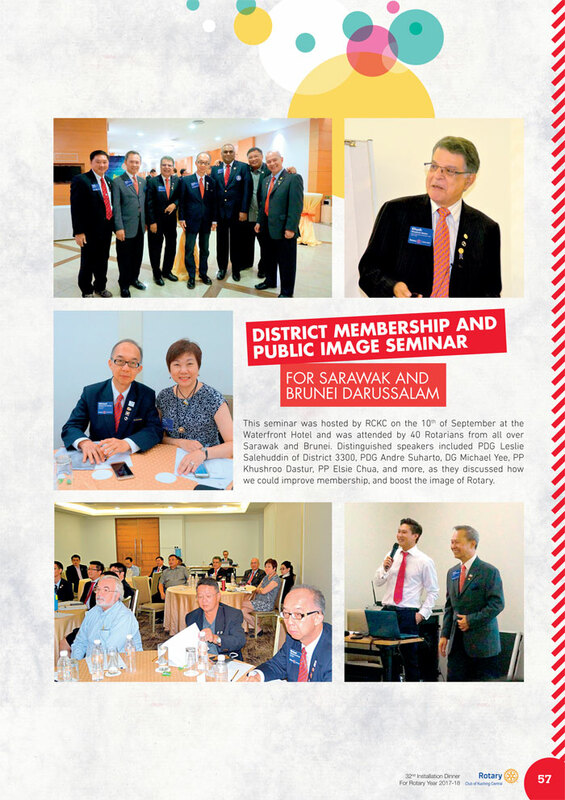 This seminar was hosted by RCKC on the 10th of September at the Waterfront Hotel and was attended by 40 Rotarians from all over Sarawak abd Brunei.